Narumi Castle(鳴海城) is the castle of Owari, current Aichi Prefecture. In Muromachi period, Ashikaga Yoshimitsu ordered his Samurai, Yasuhara, to build. This castle is one of the locations of the battle of Okehazama in 1590. 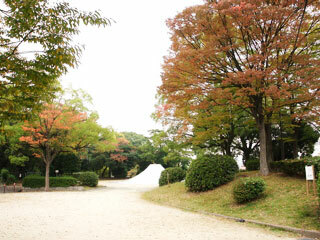 Today, it is the ruins which also used a public park. Narumi Castle was built around the begining of 15th century by Yasuhara, but after his death, this castle was abandoned until 16th century. Oda Nobuhide, the father of Nobunaga, order Yamaguchi Noritsugu to rebuild this castle to prepare for the battle against Imagawa Yoshimoto. However, when Nobuhide died, Noritsugu betrayed Nobunaga and ran for Yoshimoto, and his son Noriyoshi succeeded this castle. In 1553, Nobunaga raised 800 armies to surround this castle, but he failed to take this castle back. Later, Yamaguchi families were orderede Seppuku, Harakiri, and Okabe Motonobu, one of Yoshimoto's Samurai became the castle lord. In 1590, Nobunaga built Fort Tange and Fort Zenshoji to surround this castle. all of Yoshimoto's brunch castles were defeated and all of his armies were retreated to Suruga, except Narumi Castle. Motonobu fought against Nobunaga and kept this castle. Yoshimoto's head, then Motonobu gave Narumi Castle. The castle was ruled by Sakuma families for a while, but abandoned again in end of Tensho era. Today, it is a public park. There are couple of dry moats and dirt hills remain.